These charms are made from high quality plated rhodium which is a metal from the platinum family. They won’t tarnish or rust, are extremely durable and are scratch resistant as well. This HEART charm is filled with 13 shimmering preciosa crystals, the same type used in Miss America’s crown. This charm also has a little key attached with a smaller crystal embedded as well. 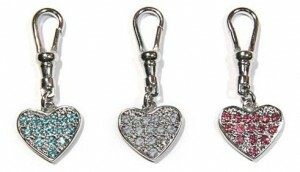 These charms with their attached D-ring clasp, clip easily on all dog and cat collars or keychains. Approximately 3/4 inch x 3/4 inch (1.9 cm x 1.9 cm) not including the attached keyring.